This game was created by GGJ17's Team Townie (Creators of Tidal Defense) for Resist Jam 17. Jackie noticed that her world was decaying and slowly becoming engulfed with darkness. There are legends of a giant living atop the beanstalk who lives alone. 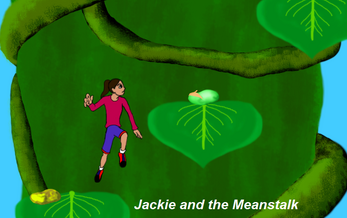 Join Jackie as she climbs the beanstalk to stop the giant above from spreading negativity unto her world. Play as Jackie who is trying to avoid the negativity and cherish the positivity that will help you with her journey.